NBN is set to embark on a two-year trial that involves a series of scaled discounts to ease the capacity pricing burden on retail service providers (RSPs) that offer National Broadband Network services. RSPs pay NBN both access charges and capacity charges when they sell services on the network. RSPs pay a per customer monthly access charge (based on the speed tier delivered to a customer) and on top of that NBN levies a monthly capacity-based Connectivity Virtual Circuit (CVC) charge, for capacity shared among all of an RSP’s customers. The CVC has long been a source of controversy for the network, and NBN late last year cut the price of the CVC to $17.50 per Mbps of capacity. The temptation for an RSP is to minimise the capacity provisioned for its customers to reduce burden that the CVC adds on top of access charges. 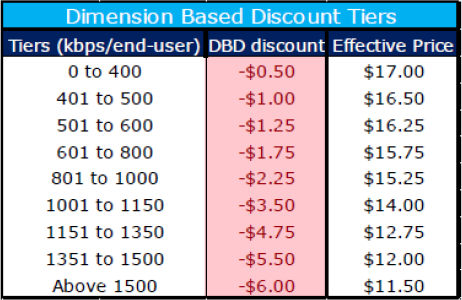 NBN revealed today that it would trial “dimension-based discount tiers” for RSPs, with increasingly large discounts based on total amount of capacity per end user. The discounts start at $0.50 for 0-400 Kbps per end user (effectively cutting the CVC to $17), up to a $6 discount (to $11.50) for 1500Kbps+ per end user. Sarah Palmer, NBN’s executive general manager, product and pricing, said that the decision was a reaction to the growth in end user traffic. NBN recently revealed that the average end user downloaded 110GB in September, representing year-on-year growth of around 70 per cent. In 2010, the average home connected to the network was downloading around 30GB per month, Palmer said in a briefing today. The move is about supporting “a bigger range of plans than a straight flat fee can do,” Palmer said. “So you could have very few end users and on average be quite generous with how much capacity you use, because that’s part of your value proposition, or you could have lots and lots of end users and be not-so-generous in your capacity,” Palmer said. Because the discount is based on capacity per end user, the total number of customers an RSP has will not affect it, so RSPs of all sizes will be able to benefit from the discount, Palmer said.